I’m no good at gardening. But I’m great at eating all the things that come out of a garden. So I have that going for me. I’m also pretty good at scrolling through Pinterest. Sometimes, I like to peruse Pinterest while eating either things from the garden, or just things in general. 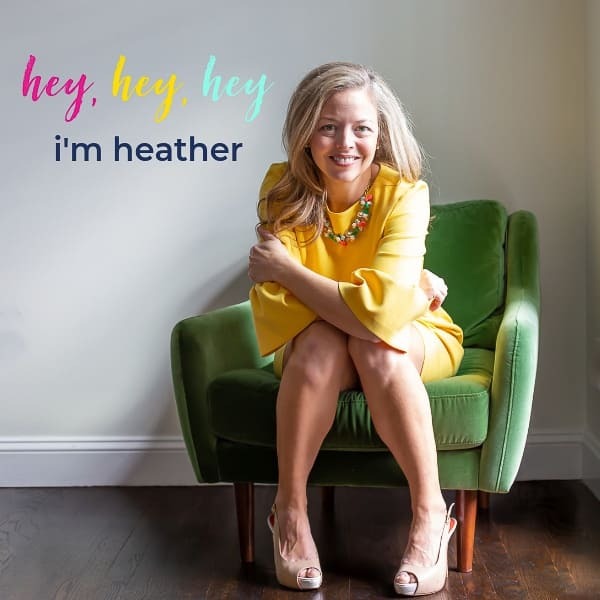 Like the other day, while I was enjoying lunch (read: polishing off the last box of hidden Samoas) I noticed something.Pinterest appears to be in bloom. I’m telling you, right now, Pinterest is OVERLOADED with images of all things that flower, grow in the dirt, and require a green thumb to care for. It’s completely inspiring, yet horrifying for someone like me whose thumbs are black. Despite the black thumb issue, luckily, we do have some skill here at the nest. 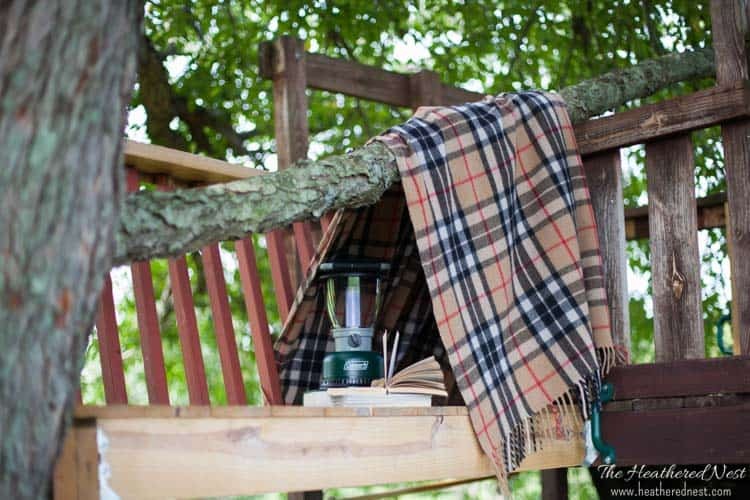 With all that flora and fauna inspiration in mind, a project bloomed in our minds. We decided to build a DIY vertical garden. 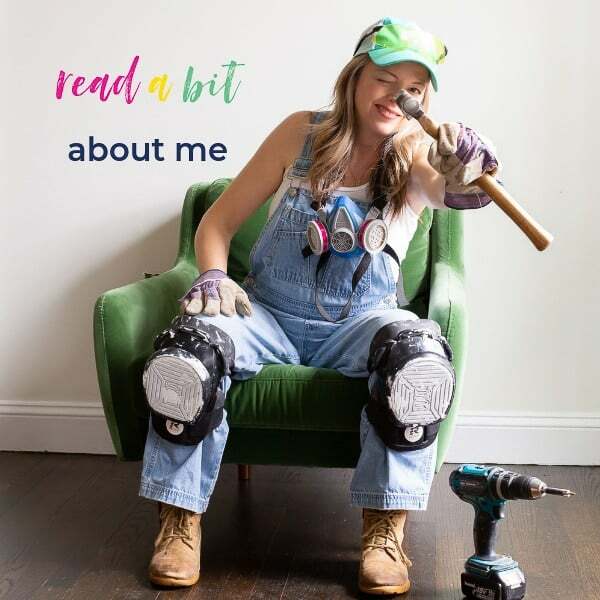 And if you’re the type with a green thumb, but don’t know the difference between a hammer and an anvil, maybe we can work out a trade. 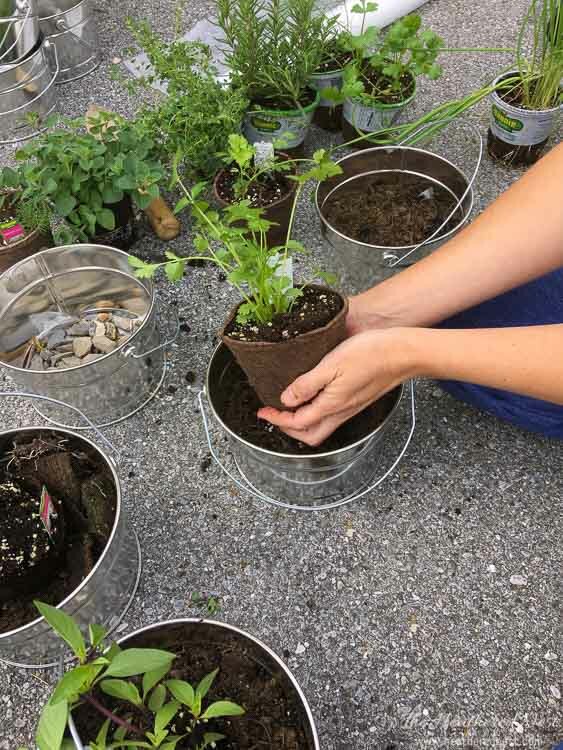 How bout some fresh herbs from your new DIY vertical garden in exchange for this little tutorial? Deal? 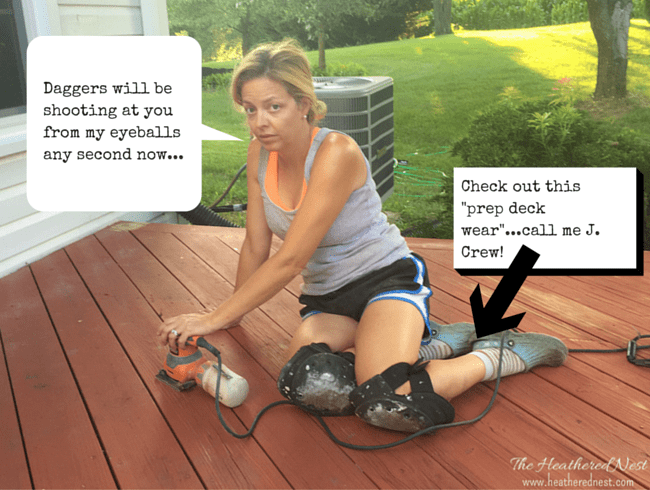 We have a deck that we did a pretty big (but cheap) makeover on last summer. One of the areas we didn’t address though was this back corner. As you can see, we have a lovely view out over the farm land. 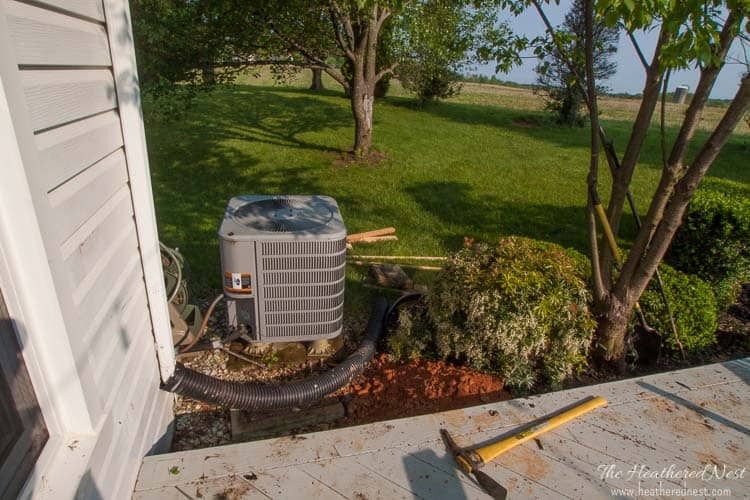 But then there’s this A/C unit sitting smack dab in the middle of my kum-bay-yah lovely view. That’s where we’re going to build our DIY vertical garden. 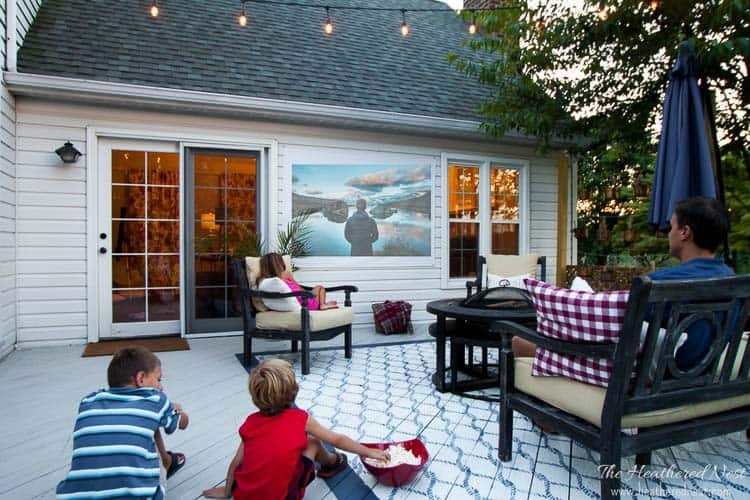 It’s not going to totally obscure that unit, but it will provide something a little more zen-like to stare at over on this side of our outdoor space. We’ll also be putting a lattice screen around that thing at some point…but not today…we’ve already got enough on our plate, right? Actually, scratch that. There’s always room for a bit more cake on a plate, right? Yummmm. 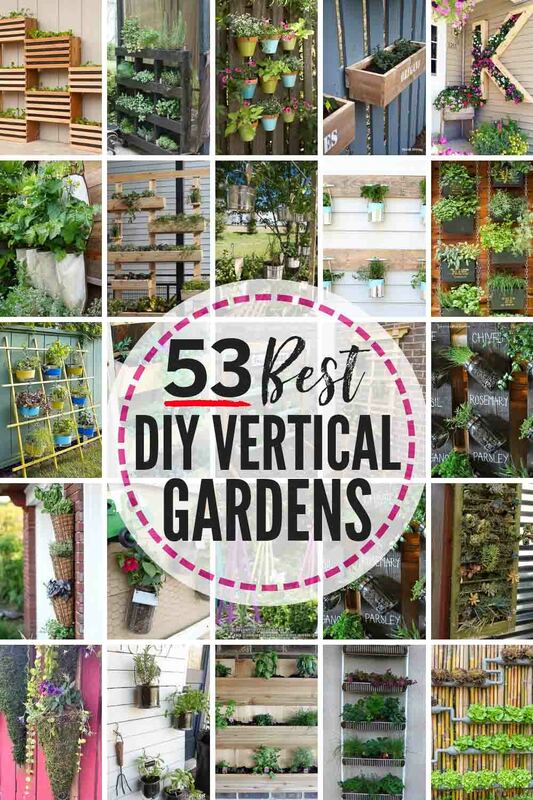 Determine the width and height that you want your vertical garden to be. Ours worked out to be about 7′ tall by 6′ wide. 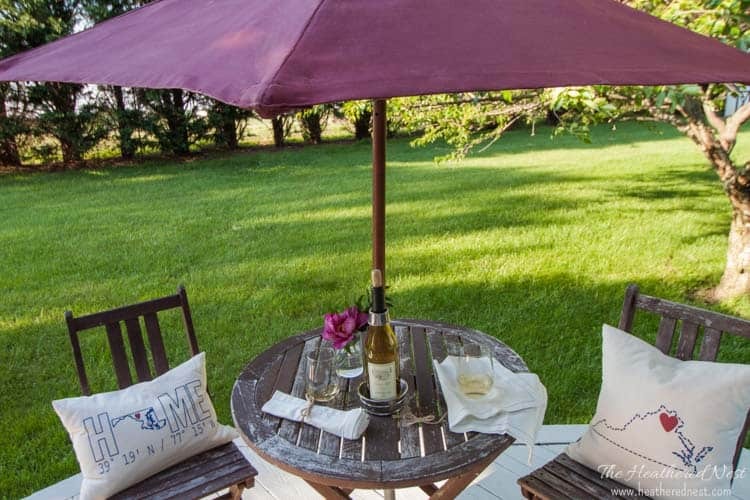 Clearly, this will be highly dependent upon the space you have to dedicate to this garden. 2.) Dig 2 holes, at least 24″ deep and 12″ round for your 4×4 posts. To dig the holes use a shovel and or a post hole digger…this is the suckiest portion of the project, in our opinion. If you have a teenager at home, you’re in luck. Tell em it’s payback for eating you out of house and home (I can’t seem to stop talking about eating ? ? ?). 3.) 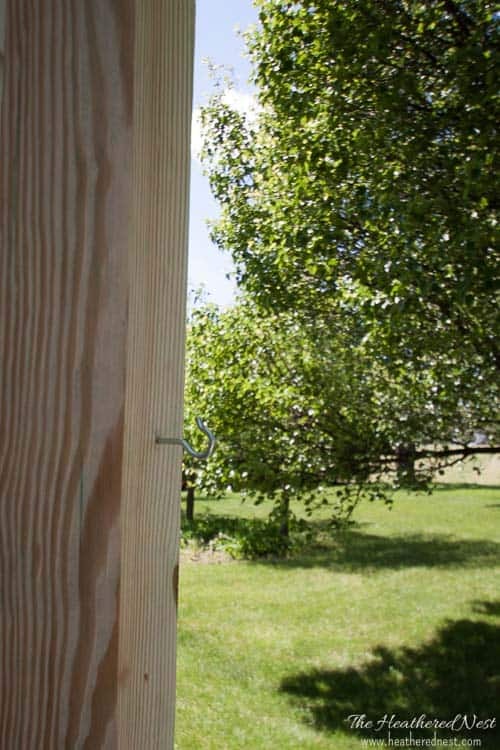 Place posts in holes, brace and plumb. 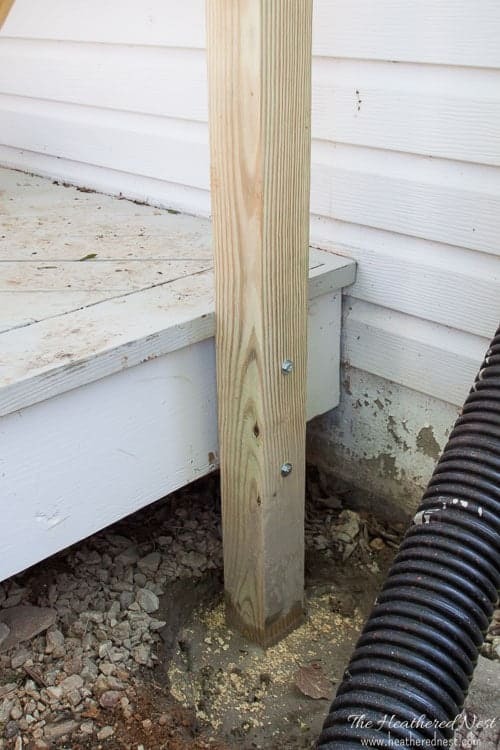 You’ll now want to stand your posts in the holes and brace them with your scrap lumber so that they can stand upright (plumb) while your concrete is setting. Above you can see how we used a scrap 1×4 to brace our post in an upright position, and used the level to make sure the post remained in a perfectly vertical position. 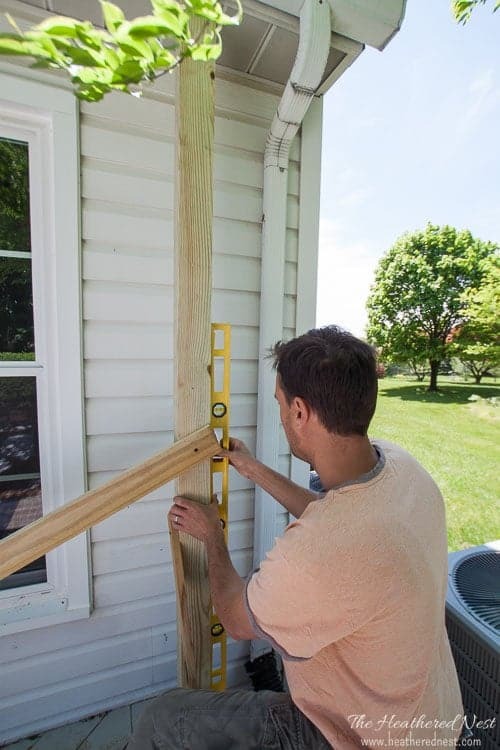 Make sure that you brace your post in TWO directions…you need to make sure your post is plumb from both side-to-side and front-to-back (you can see the second piece of scrap used in the photo below). 4.) 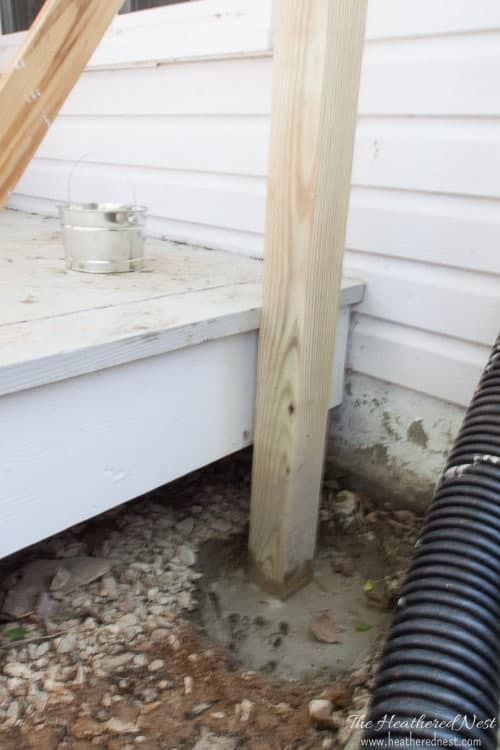 Set concrete in post holes. 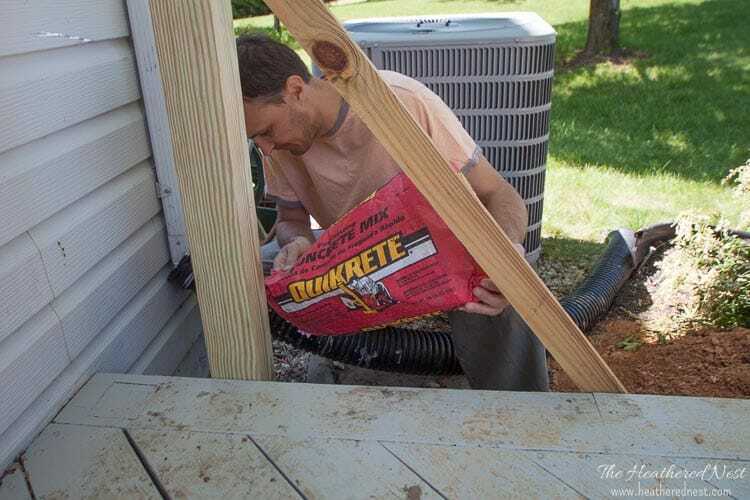 It’s now time to set the posts, using your concrete. We used Quikrete. 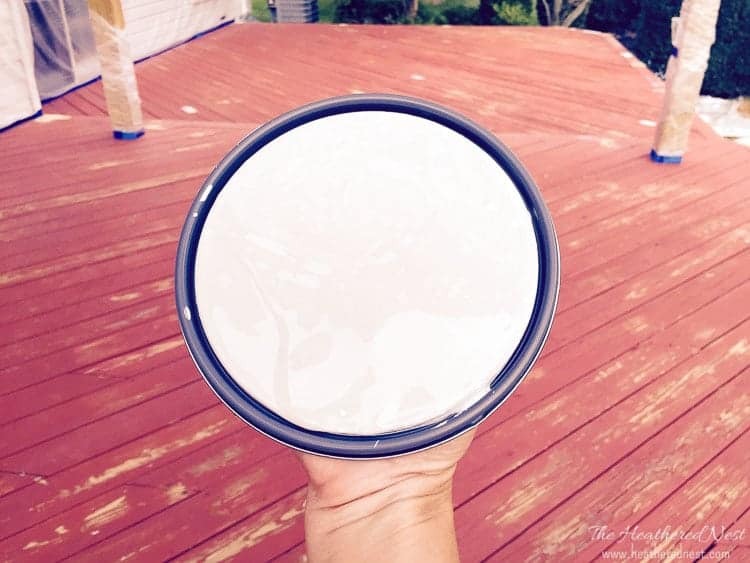 Follow the instructions on whatever brand you go with as far as determining how much you’ll need, and getting the concrete to set appropriately. 5.) Wait for concrete to completely set before continuing. Gardening, NOR patience are my strong suits. But you’ll have to wait as long as is required per your concrete instructions to allow your posts to completely set, and the concrete to cure. 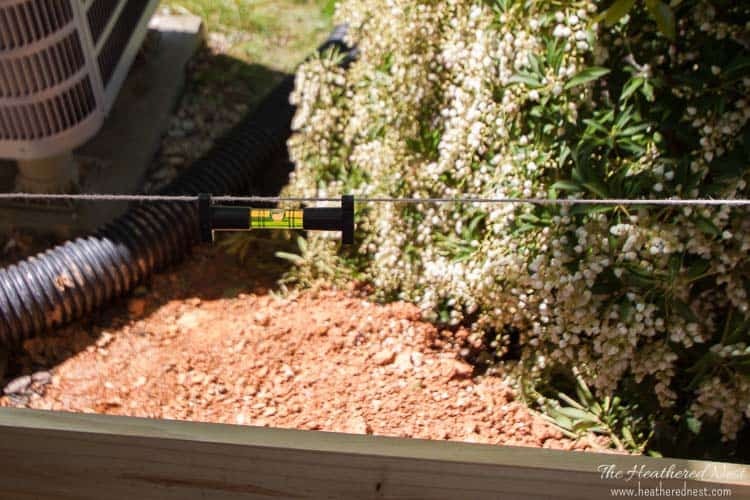 We’ll be putting some stress and tension on these posts as we rig up our wire system, so you don’t want to move forward before the concrete can hold up to the task. Maybe you’ll be doing this step, maybe not. 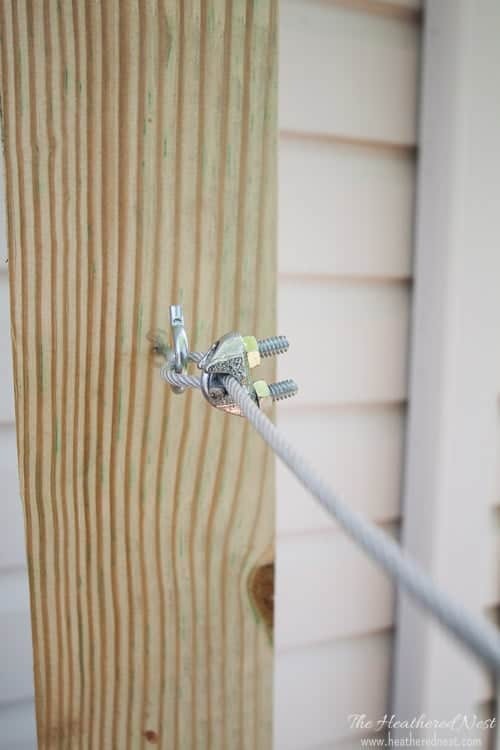 Since we placed this DIY vertical garden next to our deck, we used two lag bolts on each post to help anchor the posts to the deck. We hoped this would help in keeping the posts from bending inward once we attached the wires. Full disclosure here…we installed the wires first, but it actually bent the posts in too far and we could not get the wires tight…so we installed this 1/2″ galvanized pipe at the top to keep the posts separated. We did not realize how much force those wires put on the posts! 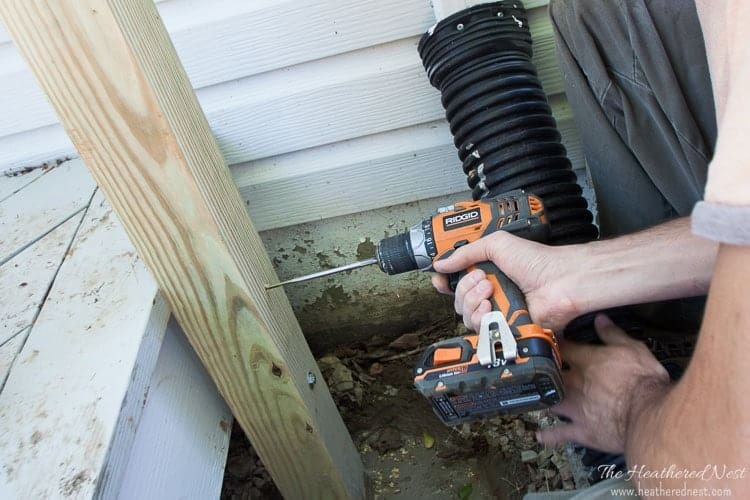 Use 3/4″ pipe stands installed on either post and then cut the 1/2″ pipe to length and install between the pipe stands. We used 3/4″ pipe stands so that the 1/2″ pipe would slide into the pipe stands…if you used 1/2″ pipe stands the 1/2″ pipe would need to be screwed into the pipe stand and that would much more of a challenge. 8.) Determine desired height for rows of wire, then mark post. 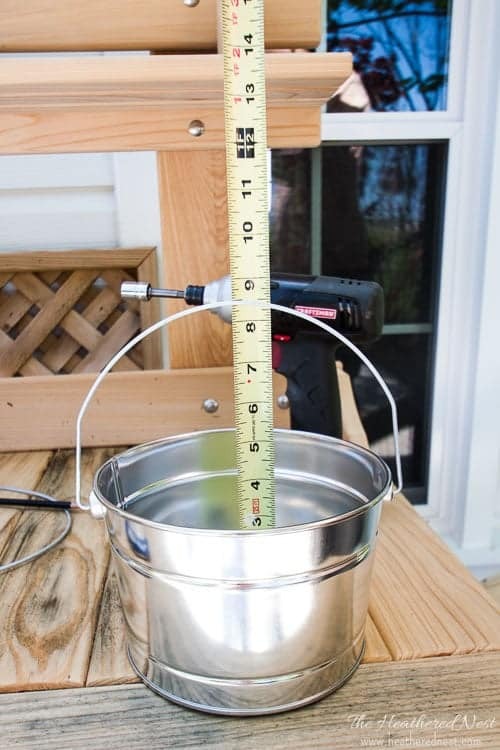 Take a look at the size of your planting buckets (hint: make sure your pots are going to hold up to the weather…we learned this the $$ way), then at the overall size of your frame. 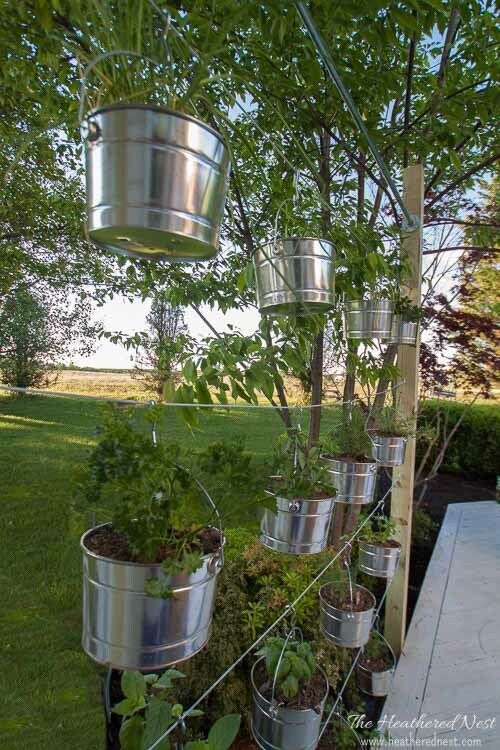 How many planters will you be hanging? 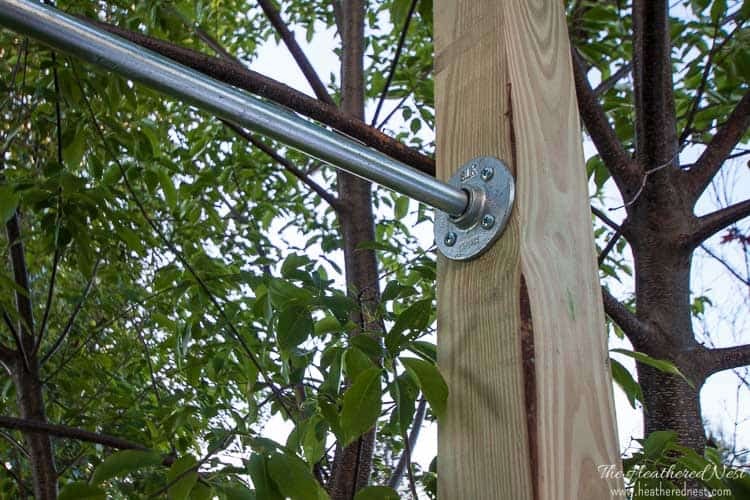 Use these details to plan out where to anchor your wires to the frame. We decided to install four rows of wire. 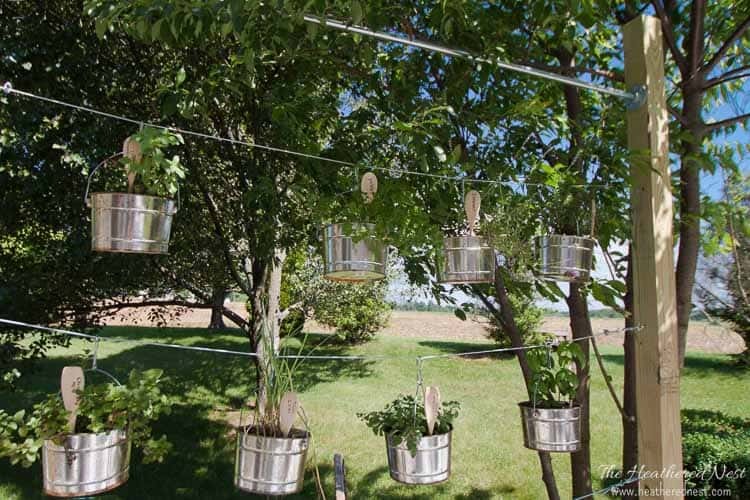 Each wire would hang four planter buckets. We started simply by eyeballing where we wanted the top row to hang. 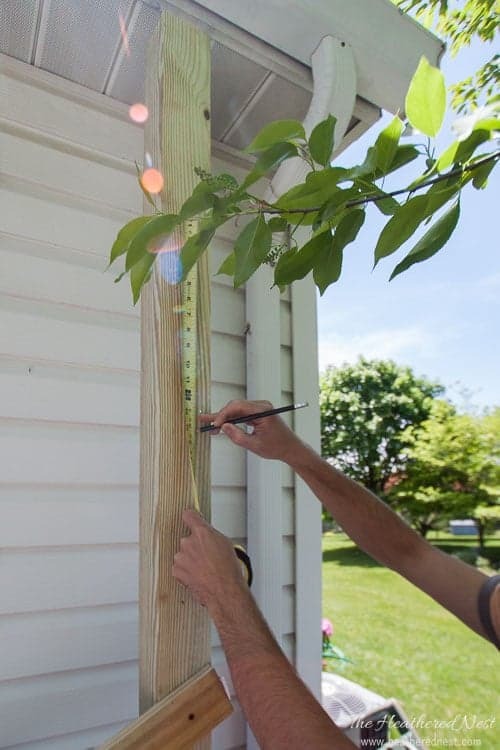 Then did some handy math to make sure the four wires would be evenly spaced along the height of our posts. We penciled in the location for the anchors along one of the posts. 9.) Pre-drill holes for hooks and screw them into one post. 10.) Measure locations for corresponding hooks on opposite post. Use line level to ensure locations are correct. 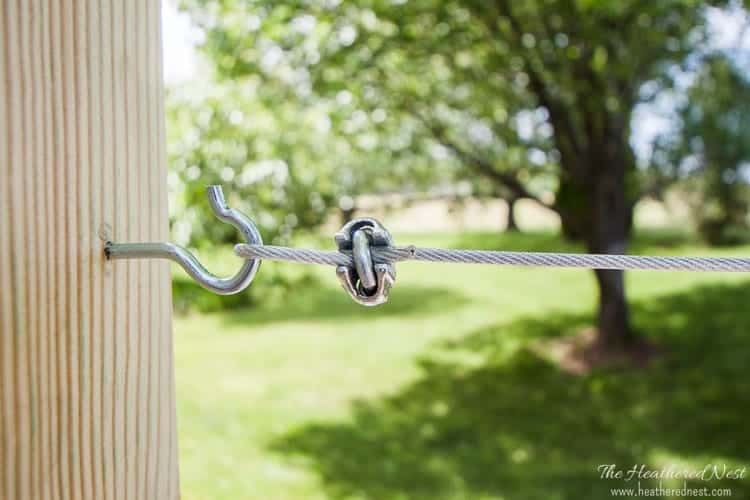 Tie a string around the hook you just installed and pull it over to the other post. 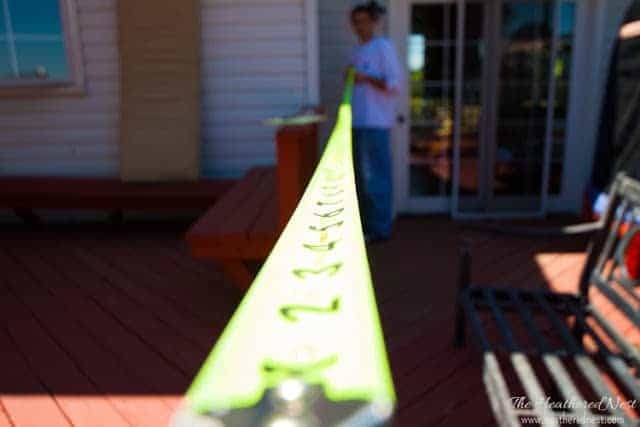 Use a line level to get the string nice and straight and then mark where the hook should go. 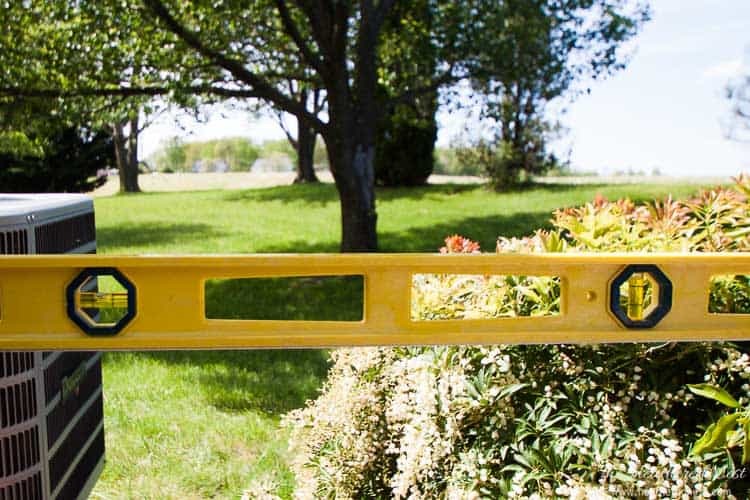 If you don’t have a line level, a standard level can be used instead, it’s just a little harder for this particular job. 11.) Screw hooks into second post. 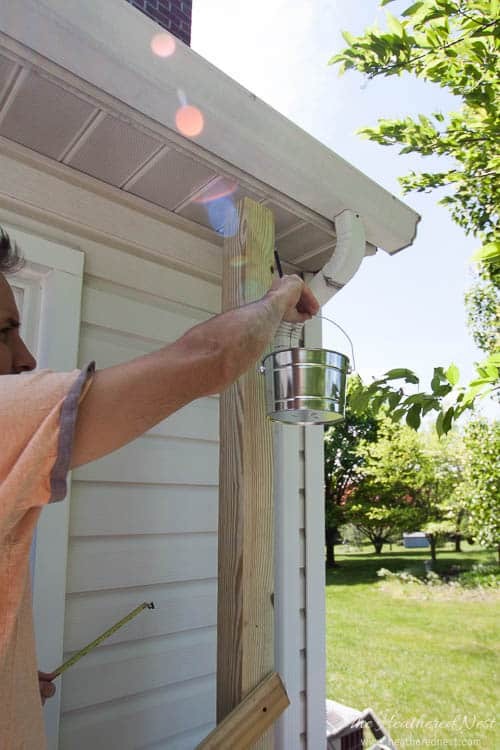 Once you know where the first hook goes on that second post, simply measure up the same distance and install the four hooks on this post. 12.) Using a cable clamp, make loop on one side of wire. Secure loop on hook. 13.) Make another loop on other end the wire. Use turnbuckle to tighten wire. Open the turnbuckle about 90% and attach it to the hook. 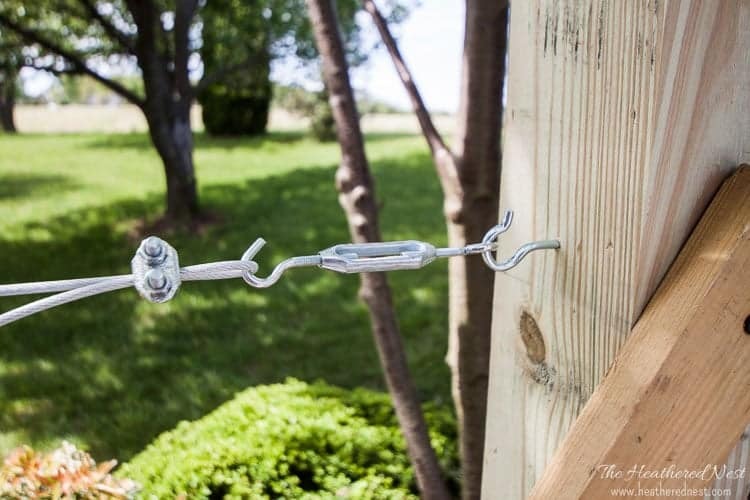 Then loop the wire around the turnbuckle hook and pull it as tight as you can secure it with the wire clamp. Now close the turnbuckle until the wire is taut. 14.) Repeat process to attach additional wire(s) to your vertical frame. I am NOT going to give advice in this realm. I have no idea what I’m doing. 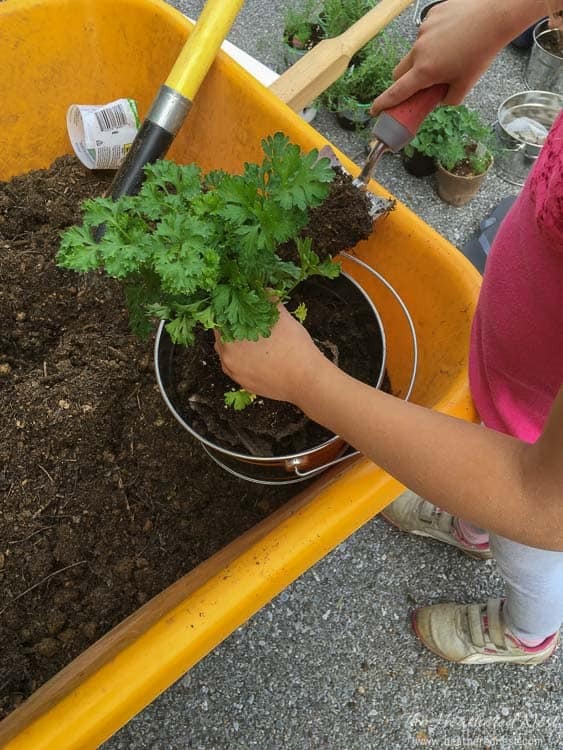 We put some rocks in the bottom of our pails, threw in some dirt, then stuffed in our herbs. They looked good (for a while). Then slowly and painfully, I began killing them off, one by one. Sad story, but true. And remember the cautionary tale I’ve discussed a bit already: the buckets we chose did NOT last longer than a season. They TOTALLY rusted. 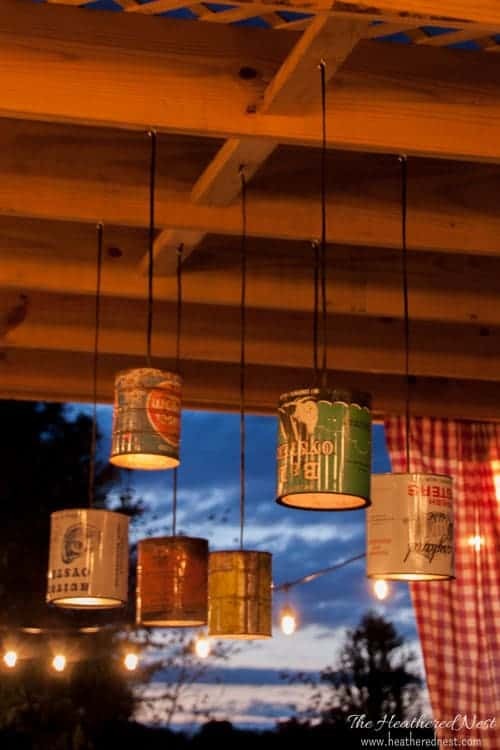 This year, I’m going to buy either galvanized pails, or some type of durable plastic. Just an FYI. Don’t make the same mistake! 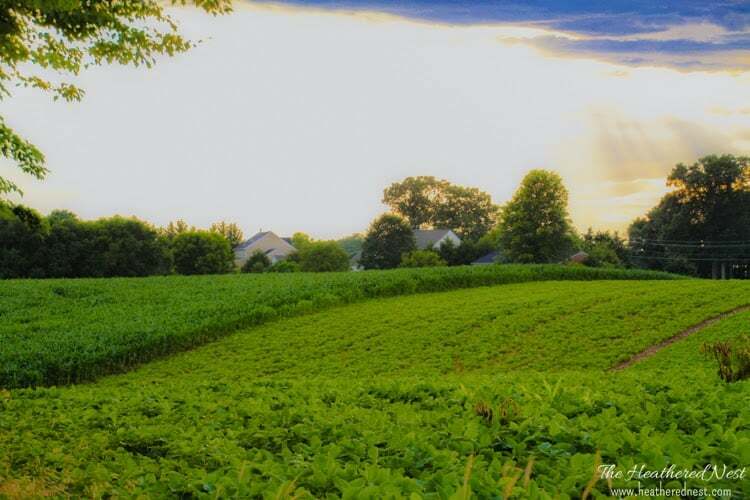 And soon, it will be time to enjoy all the fruits, vegetables and herbs of your labor. « DIY tassel sandals. Get the look for less. 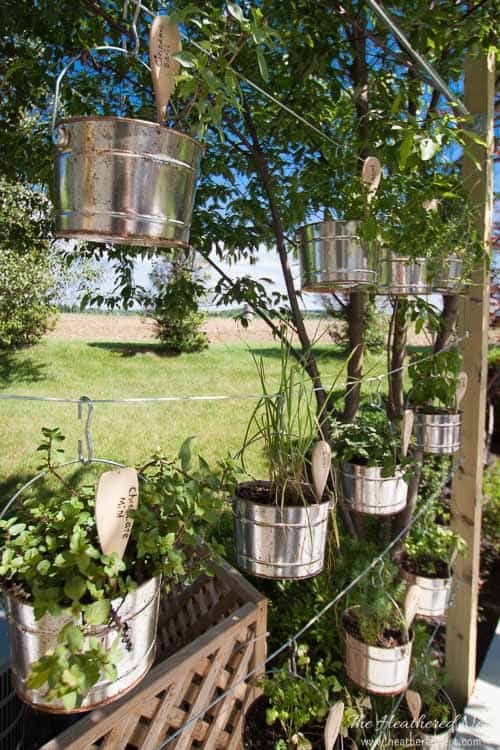 Looking at your pictures, it looks like the only things you planted in your vertical garden were herbs. Is this true? I really like the idea but we’re not into herbs. Most of the things we plant need lots of root room. I’m not sure this would work for us. We have had quite a bit of success with using the teepee method with our squash and cucumbers though. It gets the vines up off the ground so they are easier to pick and we lose less to rot from being wet on the ground. Hi Nan, yes…only herbs! I don’t grow anything other than herbs…and weeds! ?? I’ve always wanted to try the teepee method for the cucumbers, too! It looks like it would be helpful for keeping them off the ground and rotting early if the ground is too wet. Maybe one year we’ll give it a go!